Kutamo aims to solve that problem by helping people track meetings in more detail and to document decisions, outcomes and objectives online. No more pen & paper! Always waiting for the meeting leader to send out minutes or notes? How often do they forget, or they are so late that no-one ever reads them? Using Kutamo, you can import your staff and team members into a single, easy to use portal. 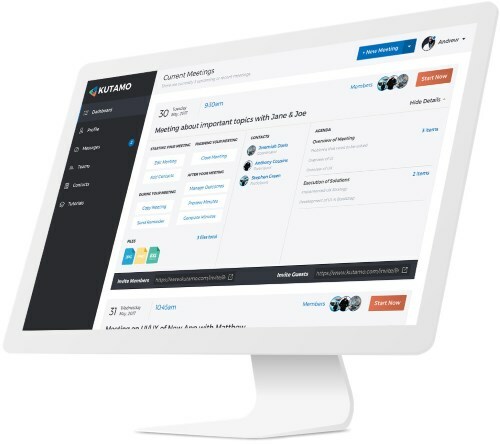 Staff members can be grouped into logical organizational teams, such as Sales, Marketing and HR, making it easy to add people as a group to upcoming meetings. During a meeting, you can share documents and files with your participants. Sharing lets you do more than just look at a document- you and your participants can comment on documents, add mark-ups, and highlight sections for discussion. A wide variety of formats are supported, including all major document formats. Kutamo integrates with a wide variety of applications and frameworks. More are being added regularly - if you have a specific integration need, let us know!